Russian Minister Ulyukayev appears in court over $2-million bribe - live updates | Russian Legal Information Agency (RAPSI). 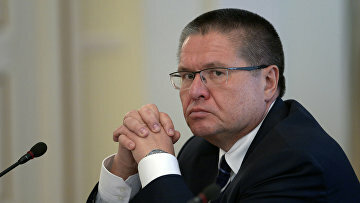 RAPSI hosted a live text broadcast from Moscow's Basmanny District Court where Russian Economy Minister Alexey Ulyukayev was brought on suspicion of taking a bribe linked to Bashneft deal. 19:32 That's all for today. Thank you for being with us. See you later! 19:21 Ulyukayev to stay under house arrest till January 15, 2017. He is prohibited from leaving his apartments without a permission, contacting with anybody, except his close relatives, lawyers and investigators. 19:18 The judge says that placing Ulyukayev under house arrest is adjusted by the circumstances of his arrest. Unfortunately, the judge didn't go into detail. 19:15 Ulyukayev placed under house arrest. 19:10 The courtroom is now fully packed by cameramen who were allowed to shoot the final scene as the judge would deliver the ruling. 19:04 Keep calm, we are going to hear the ruling soon. Judge Karpov's getting back. 18:42 Well, judge Karpov enjoys his time. We are still waiting for the ruling along with Ulyukayev. He's sitting in the courtroom like a granite monument. 18:25 The arrest of Ulyukayev reached top news headlines today because last time such a high-ranking official got under arrest in Soviet times. Notably, a group of officials, including prime-minister, was arrested in August 1991 after a failed coup. 18:11 Wow, we've got another surprise for you. Roman Nesterov is the investigator who is on the stage today. He investigated the so-called Yves Rocher case against Alexey Navalny and his brother Oleg. Here's the full Yves Rocher story. 17:59 Could you even imagine that Ulyukayev is a... poet? Russian RAPSI reveals his skills here. Ulyukayev first published rhymes in 1978. He debuted his first book of poetry in 2002, another one in 2012. Finally, in 2013 the third book titled Avitaminoz (meaning in English vitamin deficiency) was published. 17:51 Judge Karpov decided not to read out excerpts from an on-site inspection report. He said that the ruling would be handed down at 6.30 p.m. Moscow time and left the courtroom. 17:46 Interestingly, Ulyukayev was not placed in a special cage what contradicts an ordinary procedure. Instead, Ulyukayev is sitting with his lawyers on one bench. 17:39 Investigators disagree along with prosecutors. 17:34 Ulyukayev asks the court not to be placed under house arrest taking into account his senior parents. Ulyukayev's lawyer supports the claim. He turns to a comment made this morning by some top Russian official who said that detention of Ulyukayev may negatively affect the work of Russia's economy ministry. Gridnev reminds about Russian interests and the role of his client for Russian economy. 17:31 Ulyukayev says that it's in his interests to cooperate with the investigators. It should be noted here that he refused today to answer questions of investigators. At least that's what they told the court. 17:25 Investigators allege that Ulyukayev may try to flee if he is not placed under house arrest. They demonstrate an order according to which Ulyukayev should be on a business travel to Cuba and Peru. 17:16 Investigators ask the court that Ulyukayev be placed under house arrest. They claim that Ulyukayev was caught red-handed and that witnesses recognized him. 17:10 Investigators lay out evidence for Ulyukayev's lawyers to get acquainted with. 17:03 The hearing finally begins. Ulyukayev says that he is Economy Minister. He has two underage kids and problems with health. Notably, he suffers from atherosclerosis. He is speaking quietly, journalists can hardly hear what he says. 17:01 Our reporter notices prominent Russian lawyer Timofey Gridnev in Ulyukayev's team. Former Russian tycoon Mikhail Khodorkovsky and his business partner Platon Lebedev were once among Gridnev's clients. 16:51 Judge Karpov shows in the courtroom. He greeted the journalists who occupied benches of the courtroom. 16:46 As a matter of fact, Ulyukayev pleaded not guilty as he was questioned earlier today, RIA Novosti reported. 16:36 Ulyukayev enters the courtroom ignoring questions of journalists concerning his guilt. Ulyukayev is seen without handcuffs. 16:25 Judge Artur Karpov is to review the motion today filed by investigators. Judge Karpov presided over a number of high profile cases, including notorius Bolotnaya case concerning riots in central Moscow in 2012. 16:18 Those who failed to take a seat in the courtroom may watch a TV broadcast of the hearing in the hall of the court. 16:10 In the meantime, Prime Minister Dmitry Medvedev has signed a decree appointing Yevgeny Elin, Ulyukayev's deputy, Economy Minister ad interim. Presidential spokesperson Dmitry Peskov in his turn has told journalists that the decision to dismiss Ulyukayev from his post hasn't been made yet. 16:05 The hearing is to start in 30 minutes, according to personnel of the court. 15:59 Ulyukayev was brought to court not long ago. The court is buzzing. 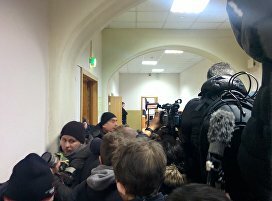 Cameramen and journalists who have been waiting for the hearing since 9 a.m. Moscow time do their best to get into a courtroom. The entrance is obviously blocked. Personnel of the court manages to keep order as buzzing increases. 15:58 May we remind you that basing on a complex operation carried out by Russia’s Federal Security Service (FSB), on November 15 the Investigative Committee opened a criminal case against Ulyukayev on suspicion that he accepted a bribe in especially large amount. According to the Investigative Committee’s spokesperson Svetlana Petrenko, the circumstances of the crime are that Alexey Ulyukayev, who holds a government post in the Russian Federation, received $2 million on November 14. Allegedly he received this sum for the positive assessment provided by the Economic Development Ministry, which allowed oil giant Rosneft to complete the deal on purchasing the government-owned 50 per cent stake in another Russian oil company, Bashneft. 15:55 Welcome to RAPSI’s live broadcast from Moscow's Basmanny District Court. We are sure you have missed it so much. We have missed these live reports as well, so today we are going to have some fun waiting for Russian Economy Minister Alexey Ulyukayev. Oleg Sivozhelezov and Vladimir Yaduta are with you today, don’t forget to refresh this page to keep tuned!